← Old couple facing eviction. Photo: Dave Hendley, text: David Secombe. In St. James’s Park. Photo: Dave Hendley, text: David Secombe. 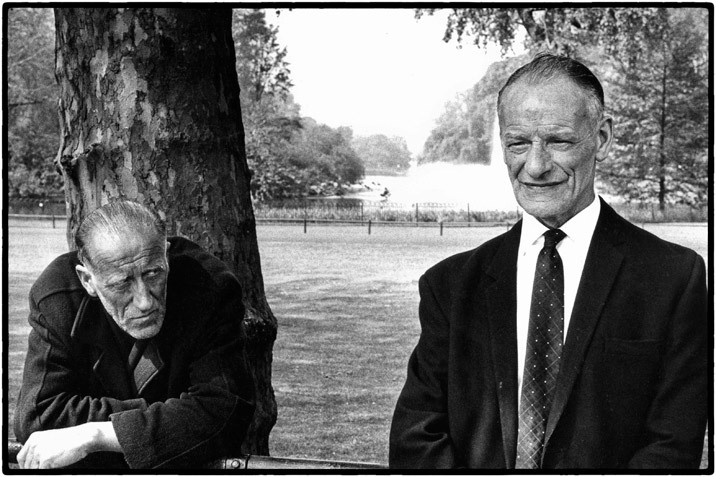 Posted: November 15, 2012 | Author: thelondoncolumn | Filed under: London Types, Parks, Street Portraits | Tags: Andre Kertesz, Dave Hendley, David Hockney, Elliott Erwitt, Entertaining Mr Sloane, Harold Pinter, Joe Orton, Robert Frank, The Servant |Comments Off on In St. James’s Park. Photo: Dave Hendley, text: David Secombe. St. James’s Park. © Dave Hendley 1973. Photography is concerned with appearance rather than truth, and occasionally, one comes across a photograph so mysterious that one is stumped for any sort of comment. One thinks of the Andre Kertesz photo of a shadow behind glass on a balcony in Martinique; of Robert Frank’s picture of a girl running past a hearse and a street sweeper on a drab London street; or Elliott Erwitt’s shot of tourists in a Mexican charnel house, all acknowledged masterpieces. I think the above photo by Dave Hendley has a similar power. Dave offers no insight: he shot it quickly with his Leica as he walked past the men, then moved along before they had time to register that he had taken their photo (‘I was more ruthless back then, I don’t stick my camera in people’s faces any more’.) But it invites speculation, so I am going to offer mine. As with the photo we ran yesterday, this photograph is a precious survivor of a cull of Dave’s early work which the photographer carried out with youthful ruthlessness. That was many years ago and, needless to say, Dave now regrets this; fortunately, this image survived as a print which Dave recently discovered in his mum’s attic. See also: Welcoming Smiles, Robert Graves.